For anyone who has worked in the advertising business, this is a fascinating book. Even if the nearest you’ve ever got to an ad agency is sipping a martini, pulling on a Lucky and snapping a secretary’s garter belt while watching Mad Men, it’s pretty darn good. 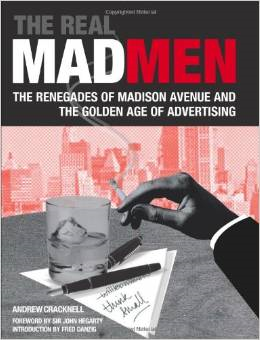 It details the world of advertising in Madison Avenue in the 1950s and 1960s, which for all of the first decade and much of the second, to all intents and purposes was where it was at, ad-wise. As well as all the details of why advertising developed as it did, there are in-depth profiles of all the key figures like Rosser Reeves, David Ogilvy, and, greatest of them all, Bill Bernbach. It’s a shame that it only goes up to about 1970. There’s another book to be written about what’s happened since then. Or perhaps two books: one covering the period until around 2000, when advertising was still fun to watch and to be involved in; the other up to the present day when the internet boomed, budgets busted, most of the enjoyment went and everyone ran scared or struggled while a very few at the top got rich. Incidentally, the derivation of the phrase ‘Mad Men’is from the ‘Mad’ of Madison Avenue, rather than ‘mad’ as in crazy, although there was a definite hint of unhingedness in some of the characters, so either interpretation feels correct. There was never a single thoroughfare in the UK comparable to Madison Avenue. Here it’s a district that’s always been most associated with advertising – Soho. So-Men? So-So Men? These days, that sadly sounds about right. Anyway, I recommend the book. And having been one of the figures at the forefront of advertising for the last few decades, its author would be in a good position to write the sequel(s)too. If you need a London-based copywriter for your website, brochure or advertising copywriting, please contact me.